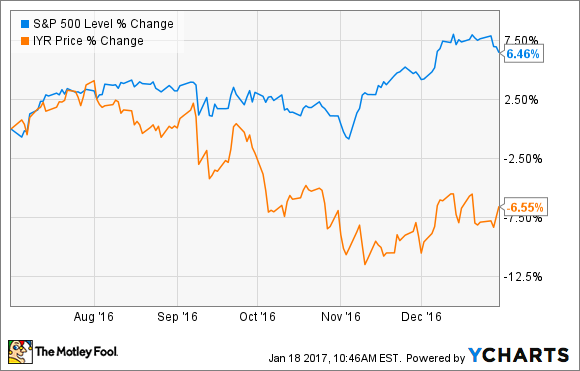 These three REITs look like good long-term buys right now. Perhaps the best stocks you can buy for your retirement portfolio are dividend stocks with strong long-term growth potential. Some of the best opportunities can be found in the real estate sector, especially as we head into 2017, as equity REITs have been among the worst performers of the past year. Here are three that look especially attractive right now. Rising rates are bad for REITs in a few ways, but the main point to keep in mind is that when rates rise, income investors expect higher yields from their investments. After all, when 10-year Treasuries pay 2%, a 4% yield from a REIT may look appealing. If those same Treasuries pay 4%, it may not seem worth the extra risk of owning the REIT unless it pays more to compensate. All other factors being equal, lower share prices translate to higher dividend yields. There are several REITs that would make excellent additions to your retirement portfolio, and here are three of my top choices as 2017 gets under way. 1. HCP, Inc. (NYSE:HCP) is a healthcare real estate investment trust that transformed its portfolio in 2017. The company spun off its riskiest assets into a new REIT, and now consists of a rock-solid collection of private-pay healthcare properties. Most of the portfolio is made up of senior housing, medical offices, and life science properties, all of which should benefit from the aging U.S. population and the growing demand it creates. HCP currently pays a 4.8% dividend yield, and excluding the dividend cut that naturally took place after the spinoff, the company has a 25+ year track record of increasing its payout, and I think it will continue to do so for years to come. 2. National Retail Properties (NYSE:NNN) invests in freestanding retail properties, and is a surprisingly defensive type of REIT, given the perceived riskiness of the retail industry by many investors. The company buys retail properties and leases them to high-quality tenants on long-term (15+ year initial term) triple-net leases, which minimize turnover risk and shift the variable expenses of property ownership to the tenants. In addition, most of the tenants are recession- and competition-resistant. Many sell goods people need, such as gas stations and convenience stores, others provide services which makes them immune from online competitors, and some offer discounts that even the best online retailers can't match, such as discount stores. With a 4% dividend yield, National Retail Properties is a member of the S&P 500 High Yield Dividend Aristocrats index, with a 27-year record of consecutive dividend increases. 3. American Campus Communities (NYSE:ACC) is an apartment REIT specializing in student housing communities. Not only does college enrollment continue to rise, but there is a big trend toward off-campus student housing, particularly upscale communities that are within walking distance to campus. American Campus Communities is the largest developer, manager, and owner of student housing in the U.S., and believes there is still room for growth. The company currently has less than a 5% market share in its target markets, and feels that growing this to 10% is an achievable goal. This is an addressable market of more than six million students, so this could translate into big profits over the years. American Campus Communities currently pays a dividend yield of 3.4%, which is the lowest on this list, but I feel that its growth potential makes up for it. Could these stocks go down more? As a final thought, it's important to point out that it's entirely possible for any or all of these stocks to go down even further. And if interest rates end up rising faster or higher than the market expects, that's exactly what I expect to happen. However, it's impossible to try and time the market or predict what interest rates will do over the next few years. These stocks all look like attractive buys now, and should all perform quite well over long time periods. So, when I say these stocks are low-risk, that doesn't apply if you plan to hold for only a couple of years. Invest with the long term in mind, and all three of these should turn out to be big winners.